naijablog: Go Tolu! Go Tolu! Go Tolu! 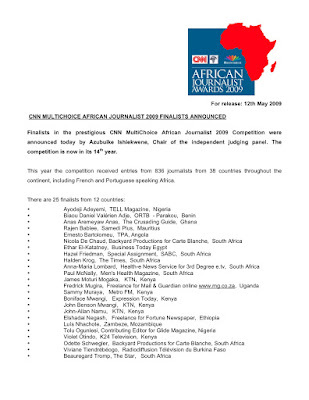 Our very own Tolu Ogunlesi has been nominated for CNN's African Journalist Awards 2009 (click to enlarge as usual). Prayer-warriors get to work. May all the heavy Ijebu Babalawos be consulted and well-remunerated. Let Eshu be libated, let Obatala smoke plenty tobacco while the sandalwood burns. And let Tolu decide to stay in Nigeria even if he wins! Tolu reminds of Toni Kan (not writing style), but in terms of their determination and commitiment to writing. Congrats Tolu. I am praying for you. I see the prevalence of Kenyan and South African journalists, makes on wonder about the quality and appreciation of Nigerian journalism. Despite rooting for countryfolk the probability leans towards either a Kenyan or South African winning since they seem to on average produce more prospective winners. Anyway, I have not seen any of their material to make a qualified judgement to buttress that assumption. @Anonymous 12:33PM - It would be perposterous to suggest others not praying as hard, I don't think prayers would win over real quality - If Tolu is the best then the best would win. May Tolu decide to stay in Nigeria even if he wins. @Anonymous: If Tolu reminds you of Tony Kan, maybe Tony's influence/determination rubbed off on him 'cos they both work(ed) together at Visafone. Na wa for this prayer o! I reject it. He cannot win. He cant even come close. I have seen his work. Not up to standard really. I hope my comment will make him work harder. Prayer warrior, please pray against Tolu winning. Ashe. "May all the heavy Ijebu Babalawos be consulted and well-remunerated"
I am sorry to say that when I read this, my first reaction was genuine surprise that Tolu Ogunlesi is nominated. I have read many of his work, and have never been that engaged or impressed. The ones for NEXT (blog) and Farafina, I have always noted as being particularly dull. Evidently, the article he submitted for consideration in the competition must have been good so congratulations to him, and to Deji Adeyemi. I spent some time with Tolu Ogunlesi when he was a guest writer at the Nordic African Institute in Sweden last year. I think he is a good role model for young people. If you want something, you've got to go out there and get it. I'll surely be rooting for him. Akin you seem preety disgruntled. chill man!!! i will pray for you is a synonymous as saying goodluck!!! Tolu is chude's friend, a part of the cult the fool is building, so that gives him 'the shine'? Thank God CNN is not a future award hogwash. in this case, the winners will be judged on ingenuity rather than friendship. Cheap bitterness, thats all you can ever offer. Would love to hear from your shallow, empty mind if Tolu should win! Meanwhile, Tolu and Deji have my warmest wishes and prayers - all the same.